TOKYO – The Japan Aerospace Exploration Agency (JAXA) announced Monday, Dec. 7, that Japanese Akatsuki spacecraft finally entered orbit around Venus after 5 years soaring around the Solar System. The JAXA suggested the probe might now be appropriately positioned to accomplish its mission. ”The orbiter is now in good health. We are currently measuring and calculating its orbit after the operation. It will take a few days to estimate the orbit, thus we will announce the operation result once it is determined”, according to a JAXA news release. 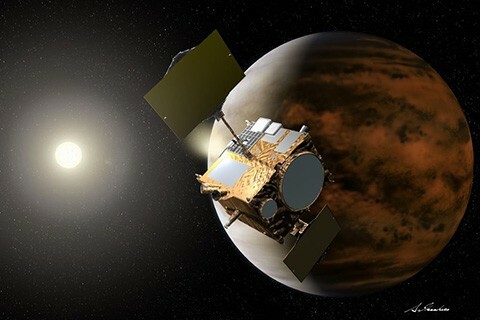 The Akatsuki probe, which means “Dawn”, failed to enter into orbit around the hottest planet five years ago. Photo: JAXA. Takeshi Imamura, project scientist for Akatsuki, declared in a statement that studying Venus could provide details about the universal meteorology principles and could also help enhance Earth’s climate models that scientists use to predict the future of our planet. This Monday, Japanese scientists maneuvered the spacecraft for the second time. If successful, the probe could soon start sending to Earth information about what makes Venus so inhospitable, even when it has several characteristics that resemble our planet. For instance, Venus and Earth both have about the same mass and basic materials, apart from the fact that they are approximately the same distance from the Sun, according to Imamura. Nevertheless, the two planets are so different and that is why the Japanese want to study Venus, so they can find out details about what tells them apart in such a dramatic way. What is widely understood is that Venus, the second planet from the Sun, is the hottest in the entire Solar System. Besides, NASA has made known that Venus’s atmosphere is 96% carbon dioxide, which makes it thick and steamy with a severely dangerous mist of sulfuric acid floating across the planet. Therefore, with lots of volcanic calderas Venus is extremely dry. Temperatures can easily reach 870 degrees Fahrenheit, hot enough to melt plumb, whereas winds approach more than 220 miles per hour, causing tremendous storms and clouds of sulfuric acid. Akatsuki was launched on May 20, 2010, and after six months a malfunctioning thruster valve caused it to fail its mission of entering orbit at Venus, on Dec. 7. Since then it has been afloat around the Sun with the hope of succeeding the second time. The probe finally established an orbit around Venus at 8:51 a.m. on Dec. 7 JST (6:51 p.m. EST/3:51 p.m. PST Dec. 6).